It is with our pleasure that Away We Go Media is sponsoring a giveaway on behalf of The Georgia Industry For the Blind. Don’t miss out on this giveaway! In 1937, the Georgia Legislature passed House Bill No. 114, which established the Georgia Factory for the Blind. In 1982 that name was changed by the legislature to Georgia Industries for the Blind. GIB’s first plant opened in 1949, in Bainbridge. Four years later, in 1953, a second plant was opened in Griffin. More than 60 years later, both plants are still vital contributors to their communities and provide job opportunities for persons from throughout the state who are blind. In 2008, GIB opened a third plant in Albany. In 2010, GIB opened its first service site at Robins Air Force Base in Warner Robins. The company produces and sells high quality office products including file folders, binders and card guides along with pillows, traffic and job site safety vests including a new line of hunting vests sized to fit adults and children. There is something for everyone to be found here. Georgia Industries for the Blind is set to generate its total operating budget through the sales of its products and services and are now unfunded by state or federal government. GIB is self supportive! 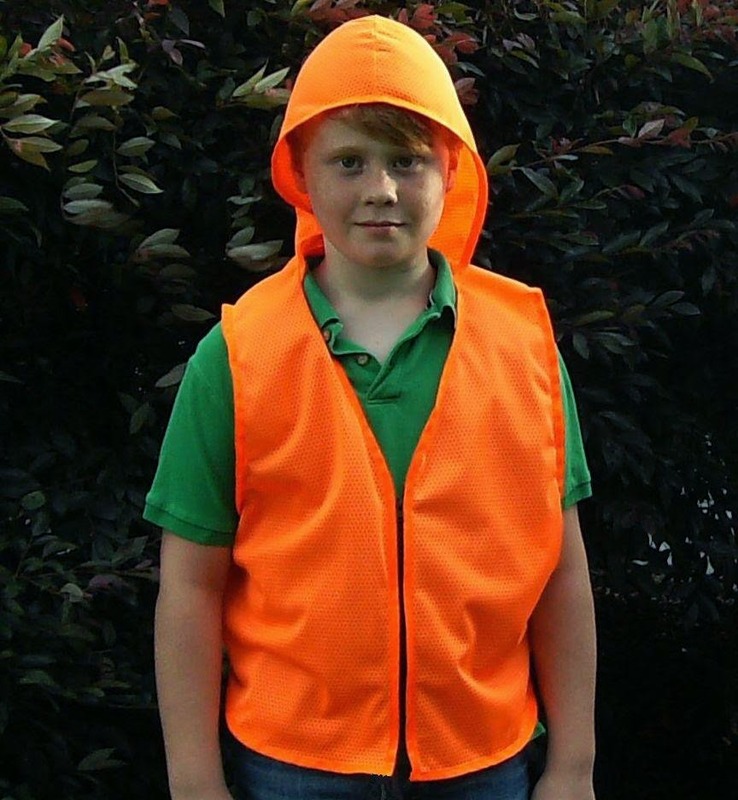 To highlight the company, its products, and to seek out new customers to the facility, Georgia Industry for the Blind is offering the choice of a youth or child’s hunting vest made by its employees to a lucky winner. This is a new line from GIB with a complete line of Hunter Safety vests. 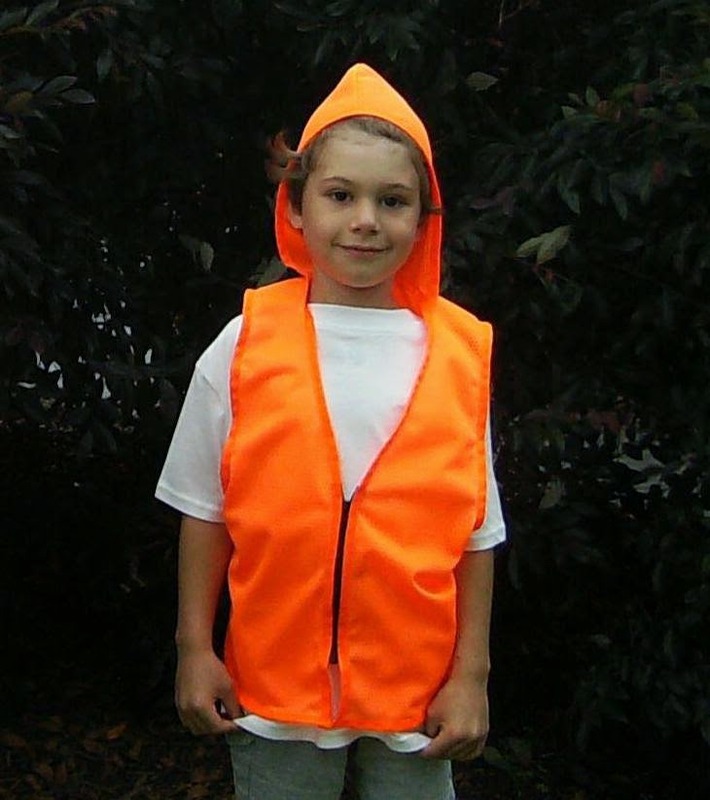 Their vests are produced from 100% ANSI approved Hi-Visibility safety orange polyester material and offered in several designs including Adult, Youth and Children’s styles with hoods for improved visibility. The flier above shows two photos displayed side by side. On the left, a child is wearing a safety vest without a hood and the photo on the right shows a child with our new hooded safety vest. Which vest would you want your child to wear? 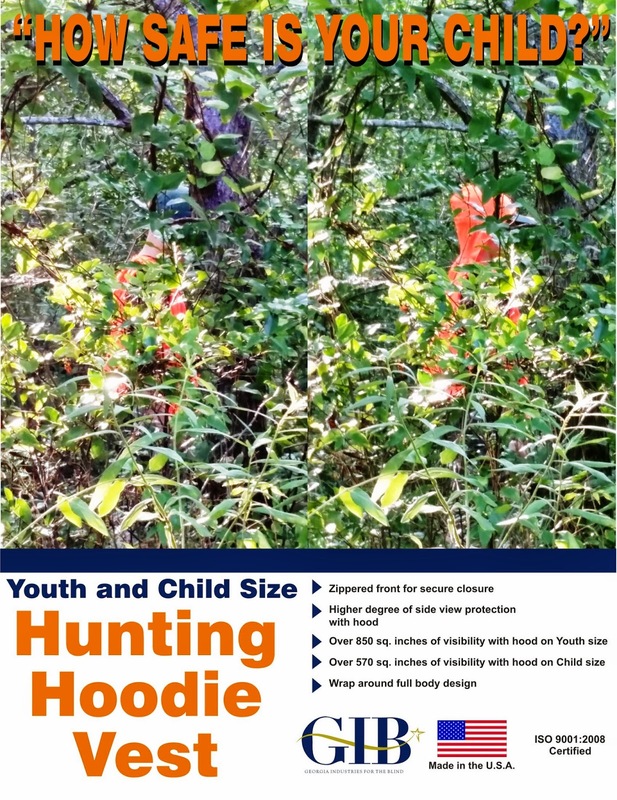 The winner will get a choice of a child or youth size hooded hunting vest. In addition to the hunting vest, Away We Go Media is giving that same lucky winner $25 Paypal cash. Let’s build pride and help GIB stay committed to providing employment for visually impaired individuals. All of this is a win for the Georgia Industry for the Blind and for you! Enter in the Rafflecopter below. NOTE: PLEASE read rules and disclosures carefully. Rules and Dislcosure: SoCal City Kids was asked to promote this giveaway on behalf of Away We Go Media and Georgia Industries for the Blind and received no compensation for this post nor is responsible for prize shipment. You must enter your full name and address and choice of youth or child vest as the first entry. This entry does not solely constitute you a win. ***If you do not enter your mailing address then you will not be eligible and if this is the sole entry you will also not be eligible. *** Your address will only be viewed by Away We Go Media and be used for this purpose and not viewed or sold to any third party. You must be at least 18 years of age to enter.You must have a Paypal account to receive payment. The payment will be in US dollars only. Winner will be picked at random by Rafflecopter and will be notified via email. This giveaway is not affiliated with Facebook, Pinterest, Google, Twitter or any other social media outlet. Twenty deserving high school students from the Montebello Unified School District were awarded $9,500 in scholarships through The Shops at Montebello’s Scholarship Awards, meant to recognize graduating seniors in the community and help them continue their education. An awards ceremony was held at the center on June 16, which recognized local seniors in their pursuit of continuing their education at a 4-year college, community college or vocational school. The scholarship program was created in 1985, when the center opened, as a way to assist local students in recognizing their educational goals and to provide initial monetary support to achieve those goals. 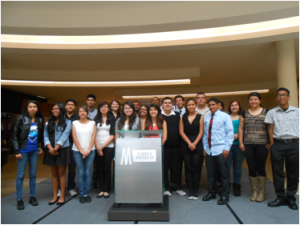 Candidates were evaluated on criteria that included a combination of academic accomplishments, work experience, involvement in the community and essay content detailing why it is important to further their educational path after high school. In addition to the completed application form, applicants were also required to submit letters of recommendation and a current school transcript. For more information, visit The Shops at Montebello on Facebook, Twitter or Instagram at www.facebook.com/shopsatmontebello, www.twitter.com/shopsmontebello or www.instagram.com/shopsmontebello. Credit: The Shops at Montebello.